Jen Hickey: Driven to Succeed in Dining Services Meet our new dining services director, Jen Hickey, who loves the Philadelphia Eagles, going for long drives with her husband, and her job at W&L. 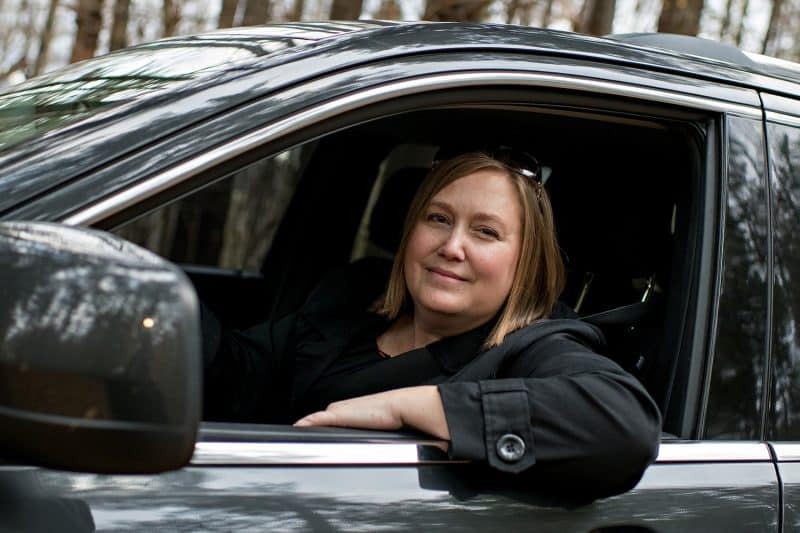 In her time off, Dining Services director Jen Hickey likes to go for long drives with her husband. “We just pick a road we haven’t been on and drive to see what we find,” she said. How long have you worked at W&L? What do you like best about working at W&L? Everything — the people, the community, and what I actually do! What advice do you have for students (or parents)? Love what you do. As people we spend almost more time at our jobs (or in our studies/class) than we do with our family and friends. To not love what we spend so much time doing is truly a shame. It’s a life not lived. Hmm … not such an easy question. I was born in Fort Lauderdale, Florida. I lived in Rutherford, New Jersey when I was two through my freshman year of high school. My sophomore year and start of junior year were in Clearwater, Florida, and I finished up high school in Gray, Georgia (right outside of Macon). Tell us a little bit more about yourself. I got remarried this summer and have two boys (and three new kids, who are all wonderful but are out on their own). Of our two youngest, one is a first-year student at Champlain College in Vermont and the other is a sophomore at James River High School. I like to cook and bake, read, and listen to music (preferably live music — pubs are great for local music). I also like to travel (but only if I can spend time with the folks who actually live there so I can really experience the culture) and just go for drives — you never know what you will find! If you could live anywhere, where would you build your dream home? Honestly, I’m not sure I’d be anywhere but where I am now. We just purchased a home that sits on four acres looking out into the mountains in Buchanan. It’s exactly what we wanted. “Tower of Dawn” by Sarah J. Mass. Now that I’m done with my master’s degree, I really enjoy reading for fun. My favorite fun genre is fantasy, typically young adult. As an added bonus, I got to chat about them with some of the youth from our church back home, and even with some student workers from my previous positions. It completely depends on my mood, but I usually listen to contemporary Christian, 70s (especially with a little funk in there) and country (the newer, less twangy kind). What is your favorite film of all time? This is another one that depends on my mood. I’m a huge Marvel and Star Wars fan (OK, maybe not all of these movies). I typically like action, but can absolutely be a sap, too. Then, of course, anything that has music or dancing in it. I definitely can’t resist a musical! Bleedinggreennation.com. I’m an Eagles fan! Although a close second would be CNN (for the articles more than broadcast). Honestly, I have no idea. I really don’t think in this way and while I could have looked at a list of historical figures and picked one that would work, I’d rather just be honest. If you could have coffee with one person (living or deceased), who would it be and why? First, I wouldn’t have coffee … I’m all for hot chocolate. But honestly, this is another one where I just don’t think this way. I can’t come up with anyone, and I think it’s because I really just try to spend time with the people who are important to me as often as possible. Tell me something most people don’t know about you? I’m really an introvert. My job requires me to be an extrovert, but I recharge by curling up with a book, vegging at home with my family or going exploring with my husband (we just pick a road we haven’t been on and drive to see what we find). What inspired you to work in the food industry? I caught the food bug early on. I’m one of those weird people who like structured chaos, and this industry provides that every day! There is always a lot going on, with new situations every day depending on who is here both working and as a guest, but it’s still the same everyday. What was your first job in the food industry? I worked part-time at both McDonald’s and Kentucky Fried Chicken during my sophomore year in high school. What’s the weirdest thing you ever ate? Either ostrich or rabbit tacos, both of which I ate before knowing what they were. Both were delicious! Although back when I had ostrich, I didn’t realize it was actually a wonderfully lean red meat. I figured it would be more like chicken. If you could only eat three dishes for the rest of your life, what would you want them to be? What food would you be thrilled to never see again? Calamari — the kind that actually look like little squids. And I’d be happy to never have sweet potatoes again. I’ve tried them lots of different ways and haven’t found one that makes me like them.